Description: Design methods of nanoparticle formulations are divided into break-down methods and build-up methods. The former is further divided into dry and wet processes. For drug nanoparticle preparations, the wet process is generally employed, and organic solvents are used in most formulations. Method: In this study, we investigate the preparation of nifedipine (IB) and griseofulvin (GF) nanoparticles without using organic solvent. 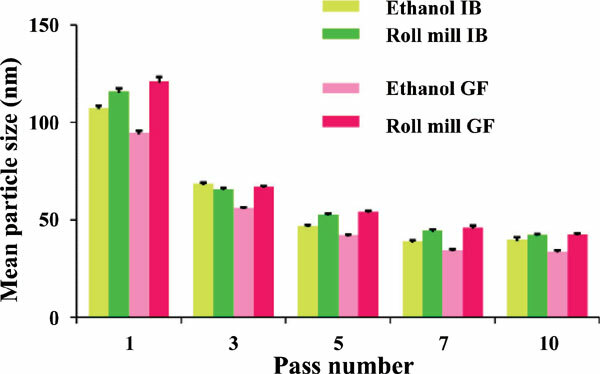 Both IB and GF nanoparticles, with a mean particle size of approximately 50 nm, were prepared without organic solvent by employing a combination of roll milling and high-pressure homogenization. Result: The X-ray diffraction peak of the IB and GF samples prepared by roll milling was present at a position (2θ) identical to that of IB and GF crystals, indicating that no peak shift was induced by interaction with phospholipids. Conclusion: These findings demonstrate that most IB and GF nanoparticles exist as crystals in phospholipids. Keywords: Nanoparticles, without organic solvent, roll milling, high-pressure homogenization, antisolvent drugs, X-ray diffraction peak, DSC. Keywords:Nanoparticles, without organic solvent, roll milling, high-pressure homogenization, antisolvent drugs, X-ray diffraction peak, DSC. Abstract:Description: Design methods of nanoparticle formulations are divided into break-down methods and build-up methods. The former is further divided into dry and wet processes. For drug nanoparticle preparations, the wet process is generally employed, and organic solvents are used in most formulations.